(Newser) – While it may be stressful—or at least guilt-inducing—for new parents, letting a baby cry it out before bed may actually be less stressful for the infant, according to a new study published this week in Pediatrics. 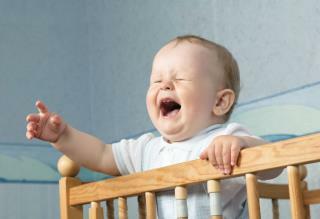 Researchers studied 43 babies from 6-16 months of age whose parents said they were having sleep problems, CNN reports. According to CBC, one-third of the parents were told to use graduated extinction, also known as the Ferber method. They let their babies cry for longer and longer periods alone at bedtime before coming in to offer comfort. Another third were told to use bedtime fading, in which a baby's bedtime is moved later and later to make the infant sleepier. The final third of parents didn't do any kind of sleep training. No doubt there is some truth to this. Bottom line, it depends on why the baby is crying. Is it because of some life threatening ailment or merely for attention. You better make the right decision. My son sometimes goes to sleep right away and sometimes he cries for a few minutes and then falls asleep. Either way, he sleeps through the night now (finally) and is happy in the morning. This idea some of you have that letting a baby cry for a few minutes is "torture" is so misguided and judgmental. Please stop with that nonsense.